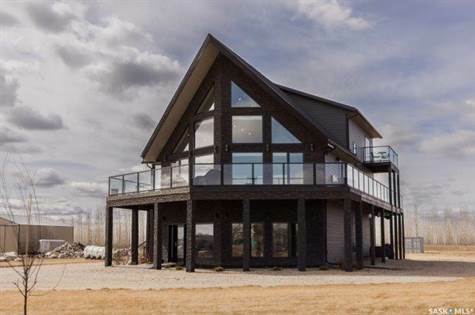 Exceptional One of a Kind Custom Built Home with a Spectacular View!\r\n\r\nThis impressive acreage is located just minutes from the city on 1.6 acres situated at Skyview Estate on Blackstrap Lake. This amazing 3 storey home features 3289 sq ft, a bright open floor plan with an impressive great room and kitchen, ideal for family gatherings and entertaining. A beautiful Quartz & glass gas fireplace, wall-mounted waterfall, vaulted ceiling and 21 foot windows allow for breathtaking views of the lake and countryside. An outstanding gourmet kitchen with a 14 foot double-tiered island, Quartz counter tops, glass back splash, a corner walk-in pantry, built-in stainless steel appliances and three doors accessing the massive wrap-around deck. Three bedrooms, three bathrooms, main floor laundry and upper level loft overlooking the great room. The spacious master bedroom includes a Napoleon fireplace, garden door to the upper balcony, walk-in closet with built-in dresser and a deluxe ensuite bathroom with a corner jetted tub, dual shower and twin sinks. The fully developed walk-out level has a family room, recreation area, bathroom and direct entry to a fully finished heated 24x30 garage/shop. Top quality construction and finishing throughout this fabulous home with many extra features including an elevator accessing all levels, engineered white oak hardwood flooring, custom tile, in-floor heat, triple pane windows, LED lighting, two fireplaces, electric blinds and so much more! Must be seen!